Neurocutaneous melanosis is congenital melanocytic nevus with neurological manifestations. We report a 4-year-old female child presenting with hyperpigmented and nodular skin lesion associated with developmental delay and convulsions. The child had multiple brownish-black nevi on the face and chest and giant melanocytic nevi on thoraco-abdomen, back, and gluteal region. Computed tomography scan of the brain showed calcification in the pons, right cerebellar hemisphere, and left medial temporal lobe. Skin biopsy done from nodular hyperpigmented site was suggestive of melanocytic nevi. Electroencephalogram showed multifocal epileptiform discharges. Congenital melanocytic nevi (CMNs) are proliferation of melanocytic cells that can be present at birth or may develop after a few weeks of life. Giant congenital melanocytic nevus (GCMN) can increase up to 20 cm in adult life. CMN associated with neurological manifestation is defined as neuromelanosis. 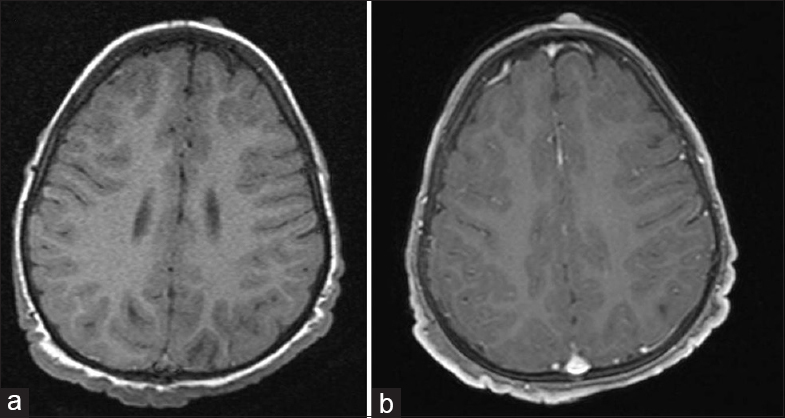 Neurocutaneous melanosis (NCM) is seen in 2–45% of patients with GCMNs. We report an unusual case where GCMN was associated with neuromelanosis and neurofibroma-like lesions. A 4-year-old child born of nonconsanguineous marriage presented with nodular skin lesions all over the body including palms, soles, and scalp since 6 months of age. There was a history of multiple episodes of convulsion since the age of 1 year. The child had global developmental delay. On examination, weight, height, and head circumference were appropriate for age. Multiple brownish-black nevi were seen on the face and chest [Figure 1]a and giant melanocytic nevi on the thoraco-abdomen [Figure 1]b, back, and gluteal region [Figure 1]c including palms and soles. Hypertrophy of genital region is present [Figure 1]b. Routine investigation, complete blood counts, and renal and liver function tests were within normal limit. Multifocal interictal epileptiform discharges were noted in electroencephalogram. Computed tomography of the brain shows calcification in the pons and right cerebellar hemisphere [Figure 1]a and in the left medial temporal lobe and right cerebellar hemisphere [Figure 2]a and [Figure 2]b. Magnetic resonance imaging (MRI) of the brain shows extensive folds in the scalp of both parietal regions with nodular enhancing lesion in the scalp of left frontal region [Figure 3]a and [Figure 3]b. Gradient-echo images of the MRI show punctuate areas of blooming in the pons and left medial temporal lobe [Figure 4]a and [Figure 4]b. Skin biopsy done from nodular hyperpigmented site was suggestive of melanocytic nevi. Hence, final diagnosis of GCMN with NCM was made. GCMN is defined by size >20 cm diameter or as a lesion that occupies a region considered major such as the face, or one that cannot be excised without resulting in significant deformity. It presents at birth in 1 in 500,000 newborns with a female predominance. The mode of inheritance is probably multifactorial. No family history was noted in our case. Eighty-two percent of the GCMNs occur in an axial distribution (trunk, head, and/or neck). In our case, predominant axial distribution is noted. GCMN usually presents as a brown lesion, with flat or mammilated surface, well-demarcated borders, and hypertrichosis. CMN is primarily a clinical diagnosis. Congenital nevi are histologically distinguished from acquired nevi mainly by their larger size, the spread of the nevus cells to the deep layers of the skin, and their more varied architecture and morphology. NCM is characterized by the presence of benign or malignant melanocytic proliferations in the central nervous system (CNS) associated with the occurrence of congenital melanocytic lesions. Melanocytic cells are found in large number in the leptomeninges of the brain and spinal cord. NCM is thought to be a result of an error occurring during morphogenesis in the neuroectoderm; however, its exact pathogenesis is unclear. The exact pathogenesis of NCM is not entirely clear although there are several schools of thoughts that contribute to the development of NCM. One factor that may contribute to the development of NCM is the abnormal postzygotic development of melanoblasts. This mutation would possibly occur within the neural crest of the ectoderm. After the mutation occurs, these cells would then migrate to the meninges as the precursors to the malignant or benign melanocytes. This mutation may be due to abnormal expression of hepatocyte growth factor/scatter factor by the mesenchymal cells within the neural crest. Another proposed cause of NCM is mutation of the NRAS gene at codon 61. This mutation has been detected in patients with CMNs, as well as those with melanocytic tumors of the CNS. The mutation would also likely occur within the neural crest. NCM is currently diagnosed according to the following criteria put forth by Kadonaga and Frieden in 1991: (1) Large and/or multiple congenital melanocytic lesion in association with meningeal melanosis or melanoma, (2) no evidence of cutaneous melanoma, except in patients with histologically benign meningeal lesions, or (3) no evidence of meningeal melanoma, except in patients with histologically benign cutaneous lesions. GCMN can occur in 5% of von Recklinghausen's neurofibromatosis Type I. In our child, neurofibromatosis was ruled out as diagnostic criteria were not met. Based on classical skin lesion with developmental delay and convulsions, we made diagnosis of NCM. Clinical and histopathological similarity between the GCMN and neurofibromas is likely to result from the fact that both melanocytes and Schwann cell originate from the neural crest. Various CNS malformations described with NCM are arachnoid cysts, choroid plexus papilloma, cerebellar astrocytoma, spinal dysraphism, Type I, and Arnold–Chiari. Approximately 10% of patients with NCM can present with Dandy–Walker syndrome and associated Dandy–Walker malformation. 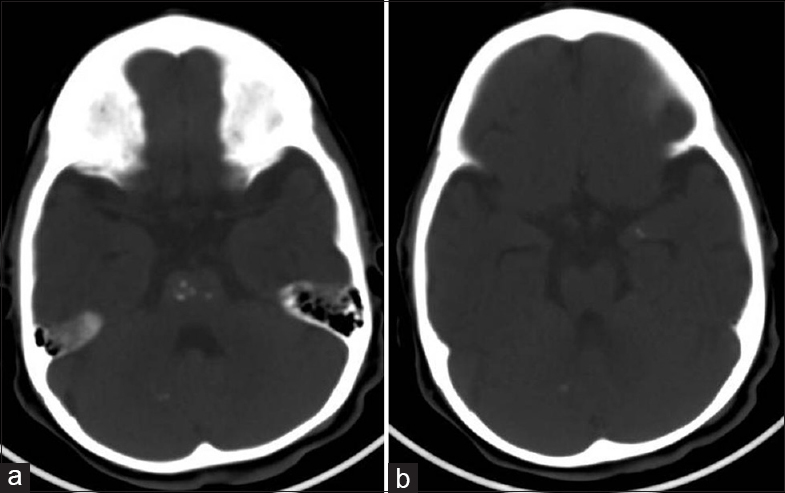 Previously multiple intracranial calcifications have not been described in the literature. 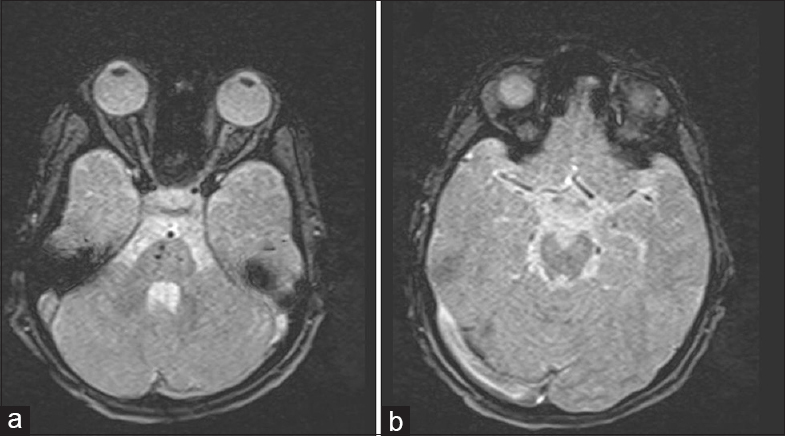 In our case, unusual presentation is giant congenital hypermelanotic nevi with neurocutaneous hypermelanosis, neurofibromatosis-like lesion, and intracranial calcifications. NCM should be considered if any child with CMN with neurological abnormalities. Clinicians should aware that not all lesions resembling neurofibromas occurring on GCMN are real neurofibromas. Viana AC, Gontijo B, Bittencourt FV. Giant congenital melanocytic nevus. An Bras Dermatol 2013;88:863-78. Kinsler VA, Thomas AC, Ishida M, Bulstrode NW, Loughlin S, Hing S, et al. Multiple congenital melanocytic nevi and neurocutaneous melanosis are caused by postzygotic mutations in codon 61 of NARS. J Invest Dermatol 2013;133:2229-36. Hadj I, Meziane M, Harmouch T, Zahra Mernissi F. Giant congenital melanocytic nevus with neurofibroma-like lesions and onset of vitiligo. J Dermatol Dermatol Surg 2015;19:58-61. Kadonaga JN, Frieden IJ. Neurocutaneous melanosis: Definition and review of the literature. J Am Acad Dermatol 1991;24(5 Pt 1):747-55. Ball NJ, Kho GT. Melanocytic nevi are associated with neurofibromas in neurofibromatosis, type I, but not sporadic neurofibromas: A study of 226 cases. J Cutan Pathol 2005;32:523-32. Silfen R, Skoll PJ, Hudson DA. Congenital giant hairy nevi and neurofibromatosis: The significance of their common origin. Plast Reconstr Surg 2002;110:1364-5.